The fight to integrate Major League Baseball has many stories and players. One that the Young Communist League can take particular pride in is the role of the Daily Worker (the “grandmother” of the People’s Weekly World) and its sports editor Lester Rodney. 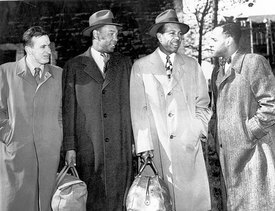 In the 1930s Rodney and the Daily Worker’s sports writers, along with the Communist Party and Young Communist League, campaigned tirelessly to break the racist color line in baseball. Rodney first met members of the Communist Party as a student at NYU in the early ’30s and was a fan of the Daily Worker, which he got on campus. Yet he was disappointed with the sports articles, which only reflected negative and narrow stereotypes of professional sports. In the book “What’s My Name, Fool? Sports and Resistance in the United States” by Dave Zirin, Rodney said he remembers sending a letter to the editor of the Daily Worker. He wrote that he shared the view that there are a lot of things wrong with sports under capitalism, but that he loved baseball and sports. He asked a question: How and why are sports important to the U.S. working class? Shortly after, Clarence Hathaway, the Daily Worker’s editor at the time, met with Rodney and immediately hired him to edit the sports page. At the same time Rodney became active with the YCL and used the DW sports page as an organizing tool in the campaign to end the Jim Crow color line in Major League Baseball. The YCL and its supporters ended up with at least a million and a half signatures that were then delivered straight to baseball commissioner Judge Kennesaw Landis. It was not until 1947, when Jackie Robinson was signed with the Brooklyn Dodgers as the first African American baseball player in the Major League, that the color line was broken. As author Zirin writes, “There is still unfinished business, but thanks to Rodney, we have a road map for the journey.” And, I would add, we can’t forget the dedication and commitment of the YCL.